So now that we're back and things are kind of back to normal, it's time for me to type up some of my notes and upload a few photos from the trip. 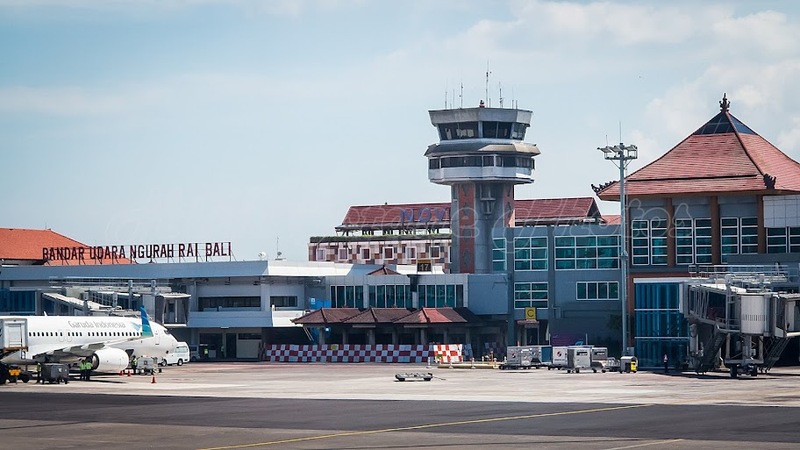 We flew out early on a Garuda flight that leaves Perth at 7:50am, we prefer this flight out, despite the early start, as it sees us landing at Ngurah Rai airport in Bali around lunch time, leaving plenty of time to enjoy the rest of the day. After a fairly uneventful flight from Perth to Bali, we made our way through customs and immigration, heading out of the airport terminal with the intention of heading upstairs to the drop off area and hopping into a newly empty Bluebird taxi, however before we could get up there we managed to negotiate a deal with a local driver with a Suzuki APV to get us to our hotel on Poppies Lane II in Kuta for 100,000 rupiah. Given that this is at least 50,000 rp less than the usual price from the "official" taxi stand at the airport, we figured it wasn't worth lugging our bags upstairs to try to get a better deal and away we went. After checking in to our hotel, the Satriya Cottages, which are pretty much at the beach end of Poppies II, we decided to go for a walk, heading north along Jl. Pantai Kuta, past Kuta Beach and into Legian. On the way we checked out the Beachwalk shopping centre, which is another Discovery / Lippo Mall type of shopping mall, with mostly well known western retailers. One of Bali's handful of genuine Oakley stores is here, with a pretty decent range of gear, and equipped to make Oakley Custom sunglasses while you wait, as are most of the Vault stores. From the Beachwalk, it was back out on Jl. Pantai Kuta, and further north till we got to Jl. Melasti and turned right. A little way up the street here is Sheppy's Bar, where we stopped for lunch. For me that meant a Nasi Goreng and a couple of Bintangs, while Lori opted for the healthier Chicken Caesar Salad accompanied by a Toblerone cocktail or two. From Sheppy's, we kept on walking, eventually ending up on Jl. Padma Utara at a little salon that Lori remembered from a previous visit. In we went for a foot massage and a pedicure each. 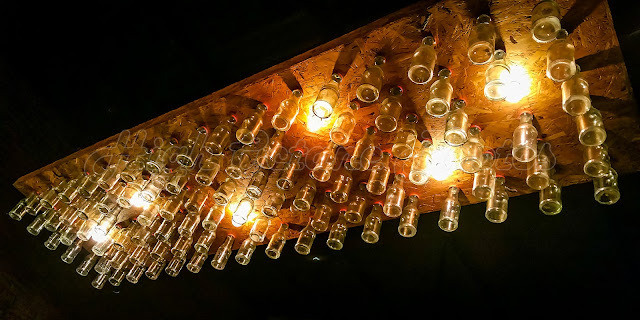 After that I needed a drink, so we wandered back to the Y-Bar, which was only about 50 metres away, and found a spot at the bar. This was the first lesson of the trip. Just because the menu says 'martini', you shouldn't really take that at face value in Bali. At the Y-Bar, it turns out a martini is just a shot of vermouth on the rocks. 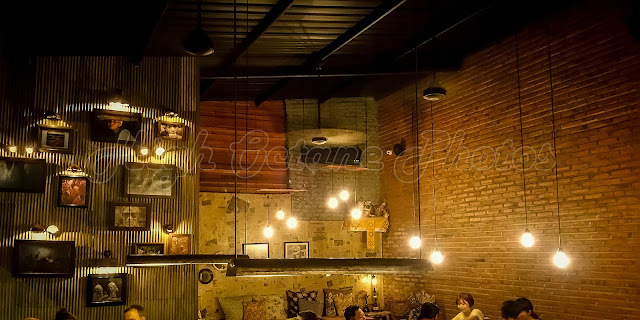 By now, we were thinking about heading back to the hotel and making plans for dinner, so we made our way to Jl. Legian and started walking south. Along the way, we popped into a fixed price shop to see if they had any coil incense burners, they didn't but of course "my brother does", so we do a little shopping and sure enough, in a few minutes someone turns up with a couple of options. We end up negotiating a deal involving some clothes and the burner, and end up paying around 150k rp for this burner, which turns out to be a pretty decent price at the moment. We found a general store selling them at 143k rp later in the trip, but no one else came close. Hardy's, who are normally pretty good, were chasing more than twice that amount. We kept on walking down Jl. Legian and around 500 metres from the intersection with Poppies II, we flagged down a Bluebird taxi, trying to explain to the driver that we were happy to go the long way around to the hotel (Poppies II is one way, and you have to enter from the coast end), but somewhere in the translation this got lost and when he got to the corner of Poppies II and Legian he dropped us off and said 'it's a short walk', well, we knew it wasn't that long a walk, and it was a walk we ended up doing quite a few times, but myself being new to the area had heard a few bad stories at night, and wasn't sure what time the lane went from just plain busy to a place you want to hold onto your belongings tight. As it turned out we never had any problems at all, but the latest we walked home down the lane would have been around 9pm. This evening, we were still pretty early, and trying to work out what to do for dinner. 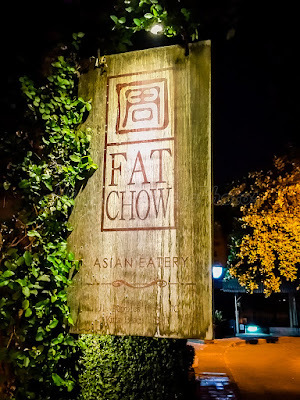 As we walked past Fat Chow, a small Asian fusion restaruant we'd heard good things about, we decided to drop in and see if we could book a table for later on that night, as it turned out, we could, and did. We headed back to the hotel, dropped our shopping and hit the shower. Freshly showered and dressed a little better than we had been during the day, we made the short walk back to Fat Chow for dinner. Tonights meal was one of the best on the trip, starting out with entrees of Chicken in Pandan leaf and Tokyo prawns, prawn wrapped in egg noodle and then deep fried. We followed this up with Nasi Campur (my pick) and Pataya Pork Ribs (Lori's pick). Dinner was accompanied by a couple of gin and tonics for me, and a couple of Pink Geishas for Lori. For desert we shared a sweet martabak with what Fat Chow call the Choco Crunch topping, basically a mix of muesli, Nutella and chocolate. The whole meal and drinks worked out just shy of 700k rp, a pretty good price for a big meal and drinks, although you can certainly do cheaper in Bali if your budget dictates. By the time we'd headed back to the hotel for an early night, we'd already made plans to come back to Fat Chow again before leaving Kuta in a couple of days.